Pre-heat oven to 170 deg fan. Put the asparagus on a baking tray and drizzle with oil and a small pinch of salt. Put into the oven for 10 minutes until soft. Boil a pan of water with 1 tsp of salt and once at boiling add the broccoli florets to the pan. Leave to cook for 3 minute or until soft. Take out and strain. Just before you take the asparagus out of the oven put the goats cheese onto a piece of baking paper and put into the oven to melt for 3-4 minutes. Mix together in a bowl the cooked quinoa, broccoli, chopped dill, and sliced spring onions. Plate with the melted goats cheese over the top with asparagus and pomegranate seeds. Make the dressing by mixing all together and drizzle over the top of the salad. 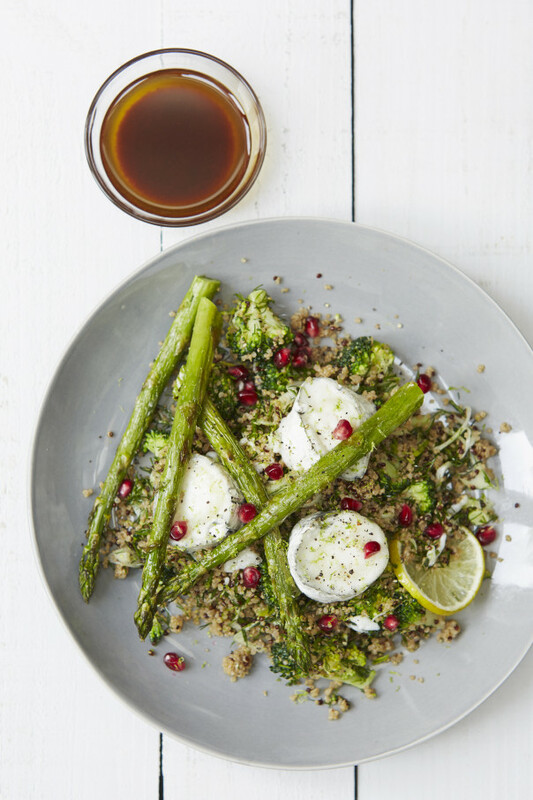 To serve place the quinoa mix onto a plate and over the top lay the melted goats cheese and the asparagus and drizzle the acai dressing over the top.